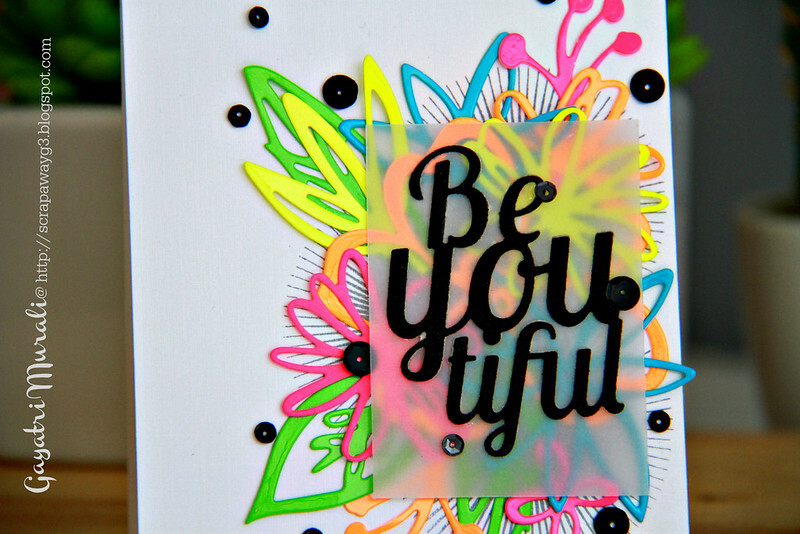 I have a beautiful neon card to share with you today. 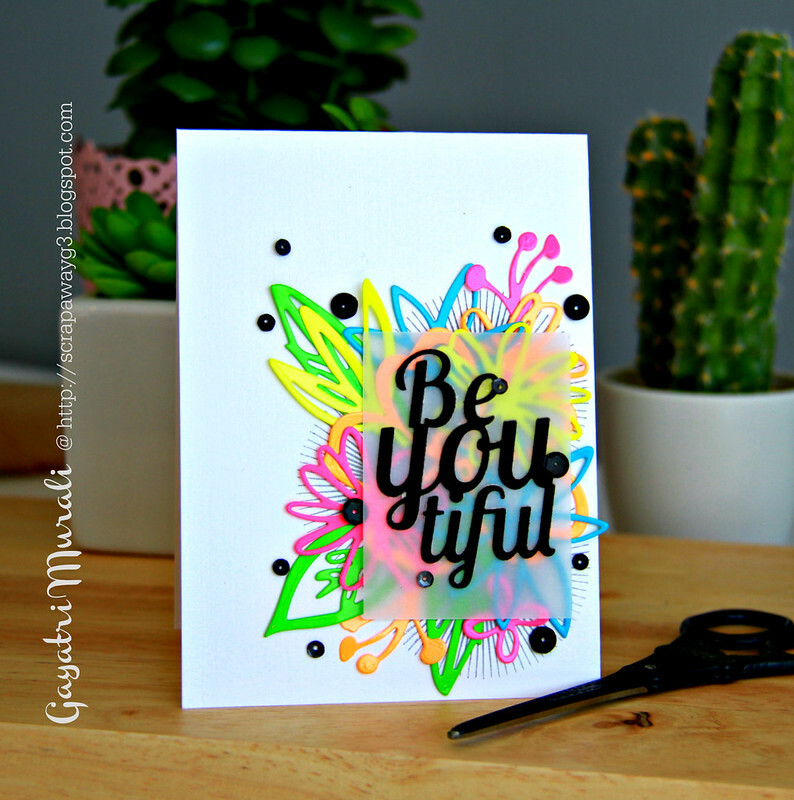 I have been wanting to play with Essentials By Ellen new release Wild Garden and Be You-Tiful dies. Finally found sometime this morning to play with it. I combined Essentials By Ellen dies with Avery Elle stamp set to play the Mix it Up challenge. I die cut the flowers, leaves from Wild garden die set using neon cardstock. I love the high contrast of neon colours against white background. Then I stamped the starbust stamp from Avery Elle called Bright Days stamp set on the card front using Memento Lux Flannel Gray pigment ink three times. Then layered and glued the neon die cuts. 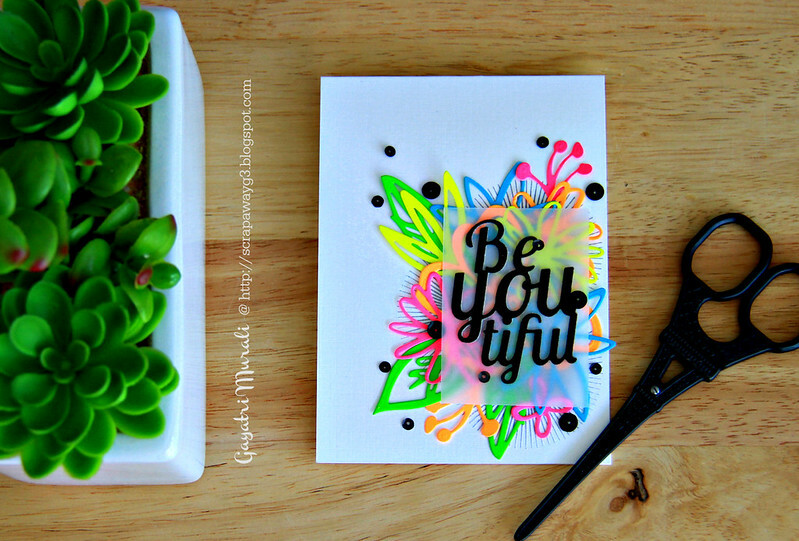 I die cut the Be You-Tiful die using black glitter paper and adhered on a rectangle vellum cardstock. I layered this vellum cardstock on the neon cluster. Finally I have used Pretty Pink Posh’s Onyx and Charcoal sequins to add more black to tie with the sentiment colour. super bright and fun card Gayatri. Amazing! Love all that color. Thanks for sharing your wonderful card. I love the colors. STUNNING!! I love the way you used the neon colors for these. Just POP right off the card!! The neon bright colors really make this card “happy”! What a great way to use neon colors The black sequins from PPP make a terrific contrast. I love how bright and bold the colors are!